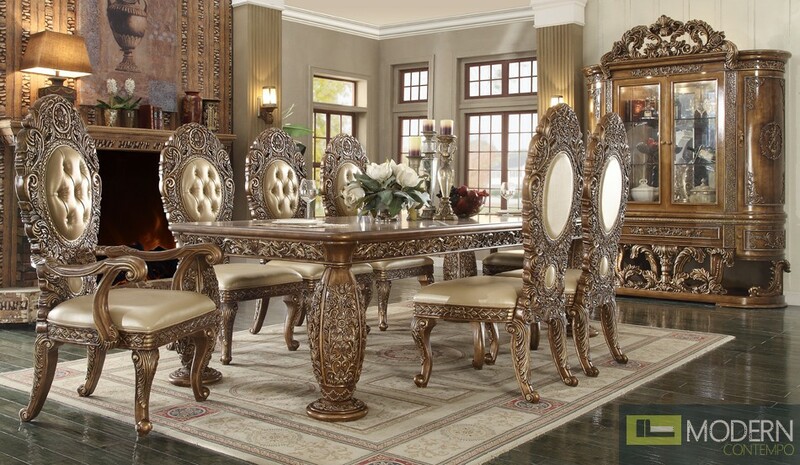 The majestic charm of the Classic HD-8018 Dining Set with Antique Carving by Homey Design stems from its antique inspiration and skillful execution of the same. Offering generous seating space to accommodate friends and family, this dining set exhibits a pleasing color scheme that is created by using tones of golden and coper. The rich carving of the table is beautifully depicted by four table legs and complementing frame across the table top. The chairs with oval-shaped backrests are upholstered for comfort. The backrest is enriched with a tufted design to enhance its look. The majestic charm of the Classic MCHD-8018 Dining Set with Antique Carving by Palazzo Royale stems from its antique inspiration and skillful execution of the same. Offering generous seating space to accommodate friends and family, this dining set exhibits a pleasing color scheme that is created by using tones of golden and coper. The rich carving of the table is beautifully depicted by four table legs and complementing frame across the table top. The chairs with oval-shaped backrests are upholstered for comfort. The backrest is enriched with a tufted design to enhance its look.